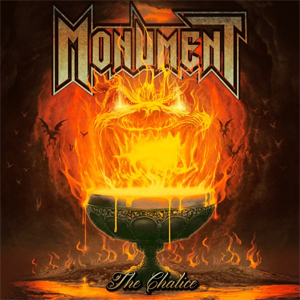 British Heavy Metal Band MONUMENT have released a new music video for "The Chalice". It’s the third single off their upcoming album Hellhound, to be out on May 25th, 2018 via ROAR Rock Of Angels Records. The video can be viewed on KNAC.COM HERE. The video includes a cast of some of the biggest names in the British pro wrestling scene such as WWE UK Superstar Trent Seven, Chardonnay Darcy, Defiant Wrestling champion Millie McKenzie, BLW Women's champion Jamie Hayter and Charli Evans. Also included in the video is MONUMENT's very own championship title belt crafted by the band's frontman Peter Ellis who also creates title belts for WWE, NXT and Channel 5's Lip Sync Battle UK, among others, with his title belt business Leather Rebels. Peter Ellis, the voice of MONUMENT quotes: ""The Chalice" is one of my favourite tracks on the album and one that I feel adds another layer to our sound that was not there previously, while still sounding distinctly MONUMENT. Lyrically, the song is about the challenges we all face in our everyday lives and the choices between good and evil that we all have to make at certain points." Hellhound is MONUMENT's third studio album consisting of 9 plus 3 bonus tracks of pure British heavy metal. Twin guitar melodies, loud bass tones, thundering drums and soaring tenor vocals are all present in abundance. Lyrically, the album draws inspiration from a variety of sources like history, urban London life, the occult and personal relationships. Tony Newton's inclusion as the band's producer has captured the band's real sound for the first time and that sound is unmistakably British." Singer Peter Ellis of MONUMENT comments: "Hellhound is, in my opinion, the best album we have released so far in our career. The song writing is a lot more mature on this album and the songs are very cohesive. Musically, it is the natural progression of Hair Of The Dog, with lots of twin harmonies, loud lead bass tones etc. Lyrically, I drew inspiration from different sources and situations, like I usually tent to do, so it is a mixture of historical themes, urban London culture as well as some more lighthearted stuff which I do enjoy writing as well. Another big step up was the inclusion of Tony Newton to the team as our producer, which played a very big part in finally being able to capture the real sound of the band on tape and it is something we have always wanted to do. MONUMENT is a "live" band and Tony was able to capture that in a really cool way."